Here's a first, brief look at Hearts of Iron 4. 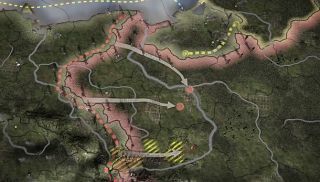 And I do mean brief: of the minute-long tour through the beginnings of World War 2, around 12 seconds are given to this latest offering from Paradox's Clausewitz Engine. If you're a veteran grand strategy fan, you already know what to expect. Maps, men and giant arrows. Also new is a HoI4 website promotion. On the official site , fans can log in to join one of the three factions—Allies, Axis or Comintern—then recruit new people for a chance at an upcoming beta. Paradox promise a more substantial look at game footage is yet to come. Hearts of Iron 4 is due out early next year.